Carry around an adorably stylized version of one of your favorite characters from the Disney universe! This Disney 3-D Series 4 Figural Key Chain 6-Pack comes with 6 individually blind packaged figural key chains. 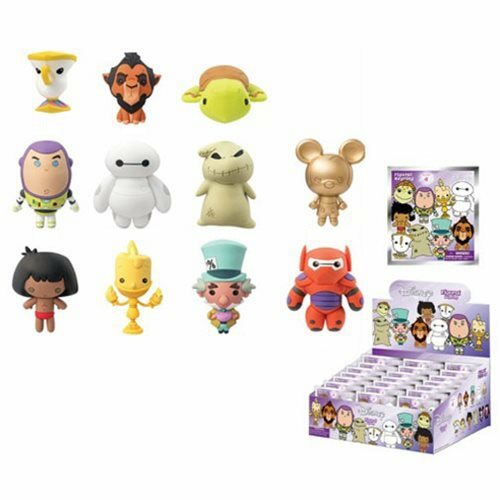 You could get Chip or Lumiere from Beauty and the Beast, Scar from The Lion King, Finding Nemo's Crush, White Baymax from Marvel's Big Hero Six, Buzz Lightyear from Toy Story, The Jungle Book's Mowgli, Oogie Boogie from Tim Burton's The Nightmare Before Christmas, Alice in Wonderland's Mad Hatter, or even rare chase versions of a bronzed classic Mickey Mouse or Baymax wearing his armor! This 6-pack contains 6 individually packaged mini-figure key chains (subject to change).